Download "Registration and Progression in Three-Year, Four-Year and Honors Programs"
1 Academic Handbook, Registration, Registration and Progression Page 1 Registration and Progression in Three-Year, Four-Year and Honors Programs INDEX Breadth Requirements for Bachelor Degrees Faculty of Registration The Degree Structure and Approved Combinations Honors Bachelor Degree Four-Year Bachelor Degree Three-Year Bachelor Degree Admission, Progression and Graduation Chart Additional Modules, Post-degree Modules, Second Degree Student Responsibility for Course Selection Registration/Course Selection Intramural Transfers to BA, BSc and BHSc Progression Requirements Elective Course Credit for all Music Courses Guaranteed Admission of Music Education Graduates to UWO Faculty of Education Brescia University College Eligibility for Modules in Health Sciences (BHSc) and Kinesiology Honors Program in French Besançon STRUCTURE OF THE DEGREE (S , S , S ) Breadth Requirements for Bachelor Degrees (S , S , S , S.09-99, S , S.15-48) Students are required to meet the breadth requirements for bachelor degrees in order to widen their knowledge and understanding across a broader range of disciplines. Exposure to different disciplines enables students to develop insight and experience in areas distinct from their main fields of study. First-Year Program Students registering in general first-year programs must choose courses that fulfill the basic requirement of 5.0 courses numbered The 5.0 courses must include at least four different subjects with no more than 2.0 courses in one subject. 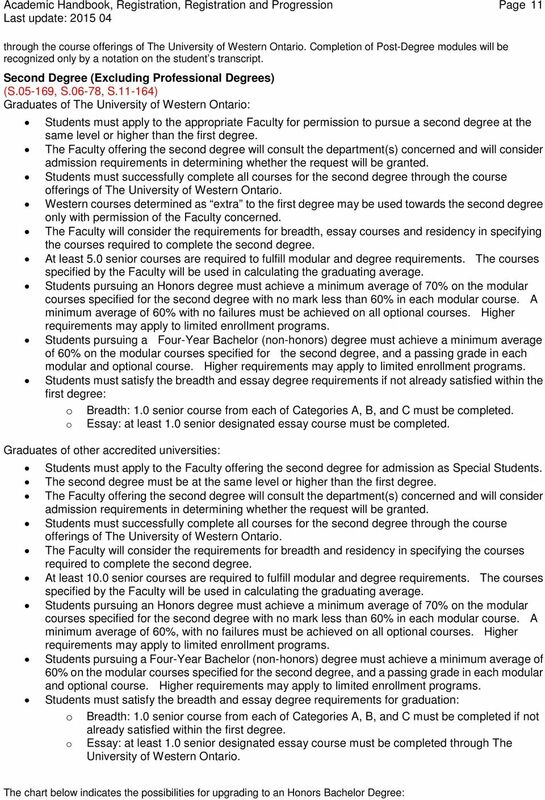 Additionally, students are subject to the Breadth Requirements outlined below. Students are encouraged to take an essay course in first year. Except with Special Permission, a student must not register for a full program of senior courses (numbered 2000 to 4999) until the 5.0 courses of first year have been completed satisfactorily. Students are responsible for choosing courses that fulfill the prerequisites for senior courses (numbered ). Specific prerequisites are included in the individual course descriptions listed in the UNDERGRADUATE COURSE INFORMATION. If in doubt, students should seek appropriate counselling and consult directly with the department(s) concerned. Prospective first-year students should seek help in choosing courses during the Summer Academic Orientation. 3 Academic Handbook, Registration, Registration and Progression Page 3 Science Actuarial Science, Applied Mathematics, Astronomy, Biology, Calculus, Chemistry, Computer Science, Differential Equations, Earth Sciences, Environmental Science, History of Science, Linear Algebra, Mathematics, Physics, Planetary Science, Statistical Sciences Various Communication Sciences and Disorders Notes: * Writing 0002F/G course is restricted to English as a Second Language students and does not qualify as a Category B course. Faculty of Registration (S ) First-year students normally will be enrolled in a first-year program in their Faculty of Registration, e.g., Arts and Humanities, Health Sciences, Information and Media Studies, Engineering, Music, Science, Social Science and Affiliated University Colleges. In subsequent years, normal entrance requirements apply for placement in modules and programs. 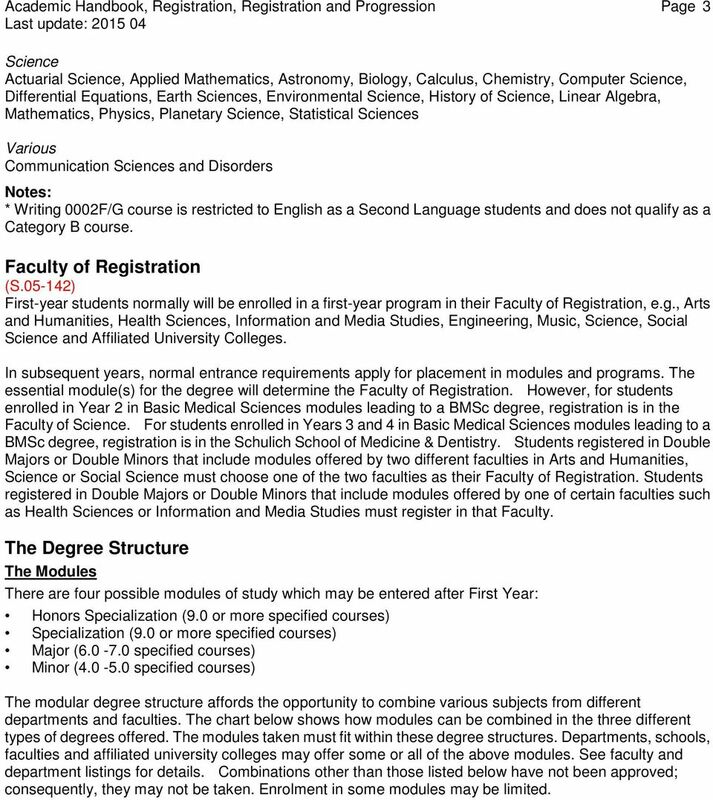 The essential module(s) for the degree will determine the Faculty of Registration. However, for students enrolled in Year 2 in Basic Medical Sciences modules leading to a BMSc degree, registration is in the Faculty of Science. For students enrolled in Years 3 and 4 in Basic Medical Sciences modules leading to a BMSc degree, registration is in the Schulich School of Medicine & Dentistry. Students registered in Double Majors or Double Minors that include modules offered by two different faculties in Arts and Humanities, Science or Social Science must choose one of the two faculties as their Faculty of Registration. Students registered in Double Majors or Double Minors that include modules offered by one of certain faculties such as Health Sciences or Information and Media Studies must register in that Faculty. The Degree Structure The Modules There are four possible modules of study which may be entered after First Year: Honors Specialization (9.0 or more specified courses) Specialization (9.0 or more specified courses) Major ( specified courses) Minor ( specified courses) The modular degree structure affords the opportunity to combine various subjects from different departments and faculties. 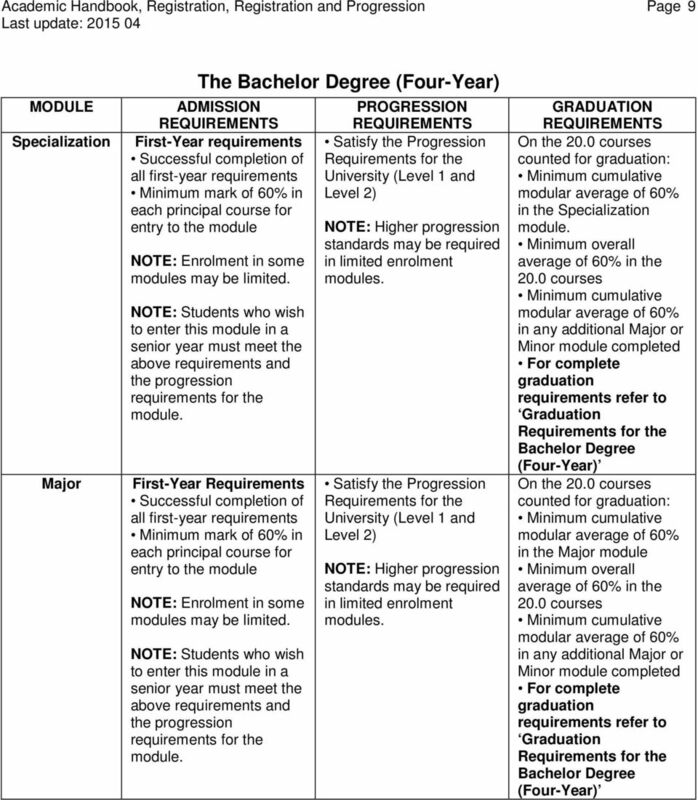 The chart below shows how modules can be combined in the three different types of degrees offered. The modules taken must fit within these degree structures. Departments, schools, faculties and affiliated university colleges may offer some or all of the above modules. See faculty and department listings for details. Combinations other than those listed below have not been approved; consequently, they may not be taken. Enrolment in some modules may be limited. 4 Academic Handbook, Registration, Registration and Progression Page 4 Approved Module Combinations for Degrees DEGREE TYPE Honors Bachelor HONORS SPECIALIZATION MODULE X SPECIALIZATION MODULE Honors Bachelor X X MAJOR MODULE MAJOR MODULE MINOR MODULE MINOR MODULE Honors Bachelor X X Honors Bachelor X X Bachelor Four-Year X Bachelor Four-Year X X Bachelor Four-Year X X Bachelor Four-Year X X Bachelor Four-Year X Bachelor Four-Year X X Bachelor Four-Year X X X Bachelor Three-Year X Bachelor Three-Year X X Bachelor Three-Year X X X (Essential Modules) X (Additional Modules) The Honors Bachelor Degree - (20.0 Courses) 15.0 courses after first year, including at least an Honors Specialization or a Double Major, as follows: Honors Specialization module (9.0 or more) This may be combined with a Major module or a Minor module or option(s). Major module ( ) plus a Major module ( ) plus option(s) ( ) This combination requires two Major modules. The Bachelor Degree (Four-Year) - (20.0 Courses) 15.0 courses after first year including at least a Specialization module or a Major module, as follows: Specialization module (9.0 or more) This may be combined with a Major module or a Minor module or option(s). Major module ( ) plus a Major module ( ) plus option(s) ( ) Major module ( ) plus Minor(s) modules(s) or option(s). Major module ( ) plus options The Bachelor Degree (Three-Year) - (15.0 Courses) 10.0 courses after first year including at least a Major module or a Double Minor, as follows: Major module ( ) plus option(s) Major module ( ) plus a Minor module ( ) Minor module ( ) plus a Minor module ( ) plus option(s) (2.0-0) This combination requires two Minor modules Notes on the Modules: Module Combinations and Overlap Modules in the same discipline normally may not be combined: e.g., an Honors Specialization module in Sociology may not be combined with a Major module or a Minor module in Sociology. However, if a department offers modules with different titles, e.g., Sociology and Criminology, the possibility for combination is at the discretion of the department and faculty concerned. Modules require specific courses, some of which may be common to other modules. Students who wish to combine modules containing the same courses must consult the department(s) and faculty concerned to see if such overlap is permitted. NOTE: Some degrees limit the number of courses which may be taken in one subject. 5 Academic Handbook, Registration, Registration and Progression Page 5 Cross Disciplinary A Cross-Disciplinary Major module consists of 6.0 senior courses (numbered ) approved by the student's Dean's Office. Only available in the Bachelor of Arts Degree (Three-Year). Not offered in the Bachelor of Science Degree. Undeclared Status (S.15-71) Second-year students who are taking prerequisite course(s) for a specific module may be registered temporarily in an Undeclared Status within a Bachelor Degree (Four Year) only. This status is available only in the Faculties of Arts and Humanities, Science, Social Science and the Affiliated University Colleges. Students progressing into third year must meet the requirements to enter a module. Transfer and Readmitted students who are admitted to an Undeclared Status must consult their Faculty regarding eligibility for specific modules. It is not possible to graduate with an Undeclared Three-Year or Four Year Bachelor Degree. The Honors Bachelor Degree The Honors Bachelor Degree must include at least an Honors Specialization module or double Major modules. Registration in an Honors degree usually begins in the second year, but admission may be gained in the third or fourth year provided the student has fulfilled the Year 1 principal course requirements and has achieved a minimum cumulative modular average of 70% with no mark less than 60% in the courses of the module and a passing grade in each option. Enrolment in some modules is limited and meeting the minimum requirements does not guarantee that students will be offered enrolment. Students intending to proceed to a four-year Honors degree should consider the degree requirements when selecting courses in first, second and third years. Four-year honors degree programs are composed of not fewer than 20.0 successfully completed courses required for the degree. 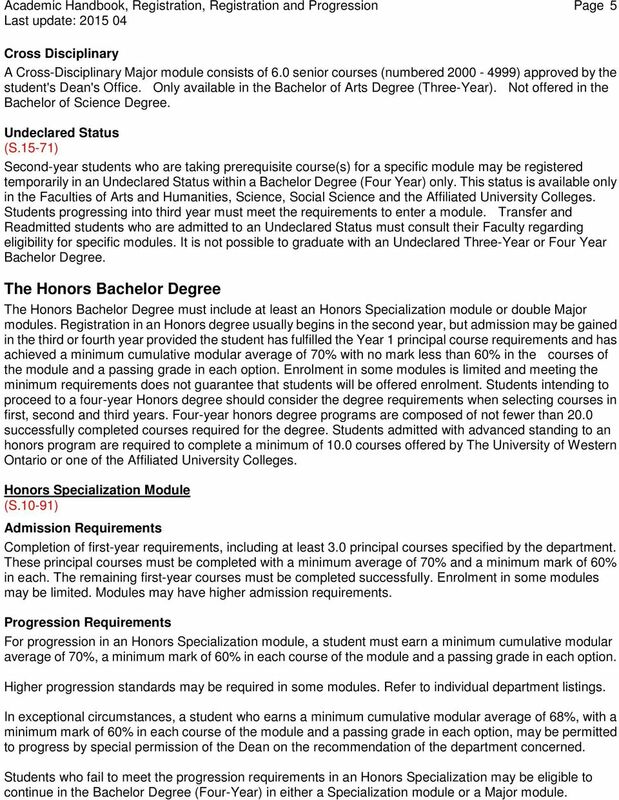 Students admitted with advanced standing to an honors program are required to complete a minimum of 10.0 courses offered by The University of Western Ontario or one of the Affiliated University Colleges. Honors Specialization Module (S.10-91) Admission Requirements Completion of first-year requirements, including at least 3.0 principal courses specified by the department. These principal courses must be completed with a minimum average of 70% and a minimum mark of 60% in each. The remaining first-year courses must be completed successfully. Enrolment in some modules may be limited. Modules may have higher admission requirements. Progression Requirements For progression in an Honors Specialization module, a student must earn a minimum cumulative modular average of 70%, a minimum mark of 60% in each course of the module and a passing grade in each option. Higher progression standards may be required in some modules. Refer to individual department listings. In exceptional circumstances, a student who earns a minimum cumulative modular average of 68%, with a minimum mark of 60% in each course of the module and a passing grade in each option, may be permitted to progress by special permission of the Dean on the recommendation of the department concerned. Students who fail to meet the progression requirements in an Honors Specialization may be eligible to continue in the Bachelor Degree (Four-Year) in either a Specialization module or a Major module. 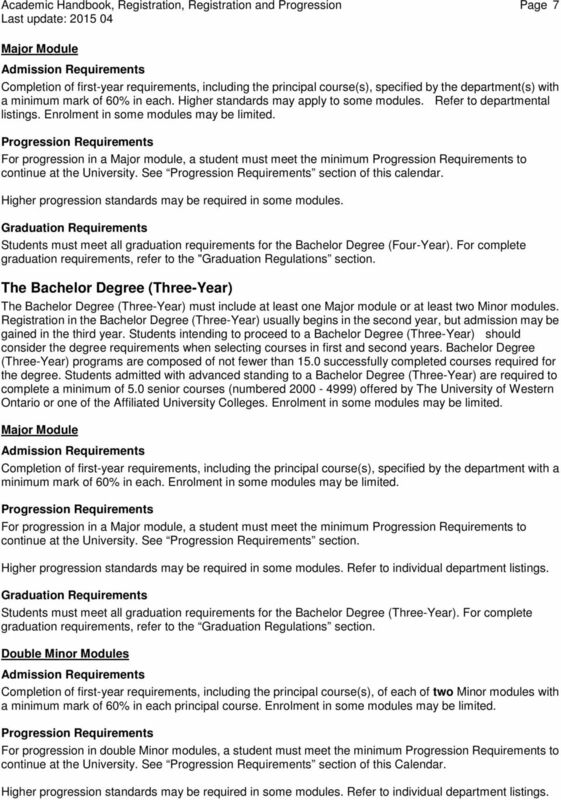 6 Academic Handbook, Registration, Registration and Progression Page 6 Graduation Requirements Students must meet all graduation requirements for the Honors Bachelor Degree. For complete graduation requirements refer to the Graduation Regulations section. Double Major Modules Admission Requirements Completion of first-year requirements with at least 3.0 principal courses, including the courses specified for each of two Major modules. If fewer than 3.0 courses are specified, the best additional first-year course(s) will be included in the total of 3.0. In some combinations, more than 3.0 specific courses will be required as principal courses. The principal courses must be completed with a minimum average of 70% and a minimum mark of 60% in each. The remaining first-year courses must be completed successfully. Enrolment in some modules may be limited. 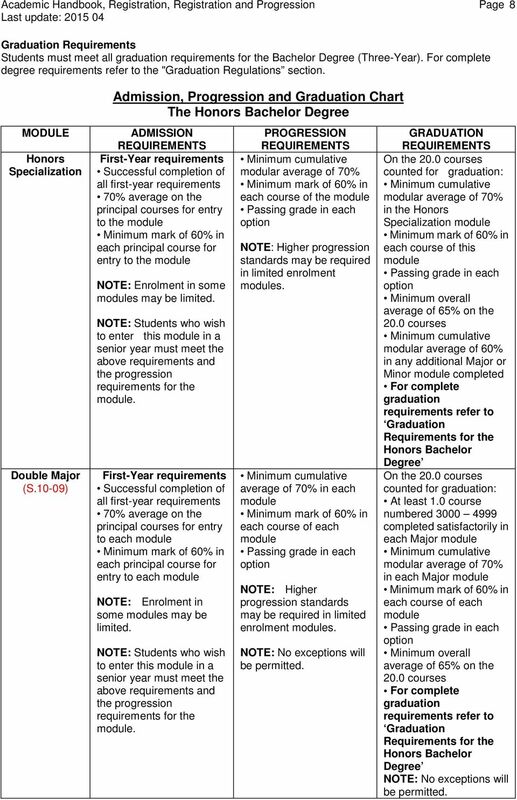 Progression Requirements For progression in an Honors Double Major, a student must earn a minimum cumulative modular average of 70%, a minimum mark of 60% in each course of the module and a passing grade in each option. The modular average for each Major will be calculated separately. Higher progression standards may be required in some modules. Refer to individual department listings. 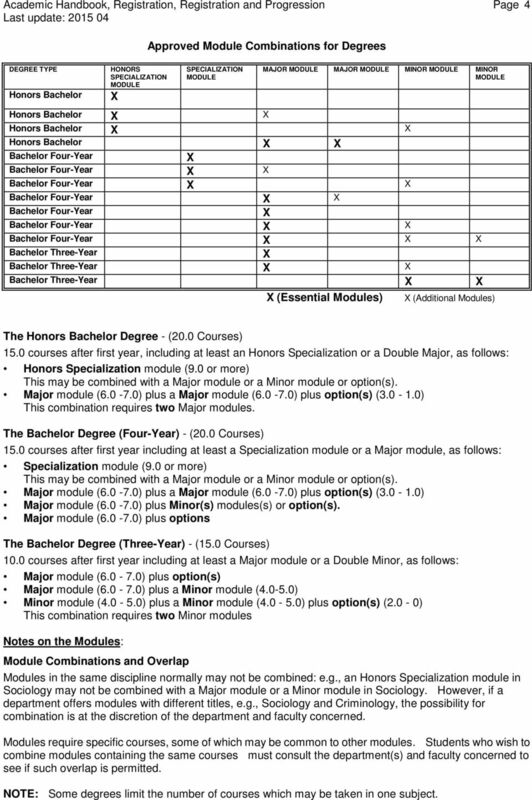 Students who fail to meet the progression requirements of an Honors Double Major may be eligible to continue in the Bachelor Degree (Four-Year) in either a Specialization module or Major module(s). Graduation Requirements Students must meet all graduation requirements for the Honors Bachelor Degree. For complete graduation requirements refer to the "Graduation Regulations section. The Bachelor Degree (Four-Year) The Bachelor Degree (Four-Year) must include at least a Specialization module or at least one Major module. Registration in the Bachelor Degree (Four-Year) usually begins in the second year, but admission may be gained in the third or fourth year. Students intending to proceed to a Bachelor Degree (Four-Year) should consider the degree requirements when selecting courses in first, second and third years. Bachelor Degree (Four-Year) programs are composed of not fewer than 20.0 successfully completed courses required for the degree. Students admitted with advanced standing to a Bachelor Degree (Four-Year) are required to complete a minimum of 10.0 courses offered by The University of Western Ontario or one of the Affiliated University Colleges. Enrolment in some modules may be limited. Specialization Module Admission Requirements Completion of first-year requirements, including the principal course(s), specified by the department with a minimum mark of 60% in each of these course(s). Higher standards may apply to some modules. Refer to departmental listings. Enrolment in some modules may be limited. 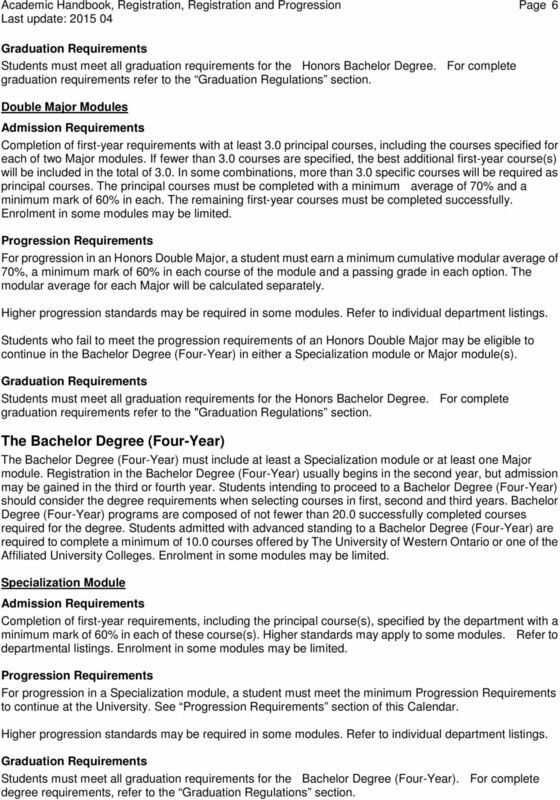 Progression Requirements For progression in a Specialization module, a student must meet the minimum Progression Requirements to continue at the University. See Progression Requirements section of this Calendar. Higher progression standards may be required in some modules. Refer to individual department listings. Graduation Requirements Students must meet all graduation requirements for the Bachelor Degree (Four-Year). For complete degree requirements, refer to the Graduation Regulations section. 7 Academic Handbook, Registration, Registration and Progression Page 7 Major Module Admission Requirements Completion of first-year requirements, including the principal course(s), specified by the department(s) with a minimum mark of 60% in each. Higher standards may apply to some modules. Refer to departmental listings. Enrolment in some modules may be limited. 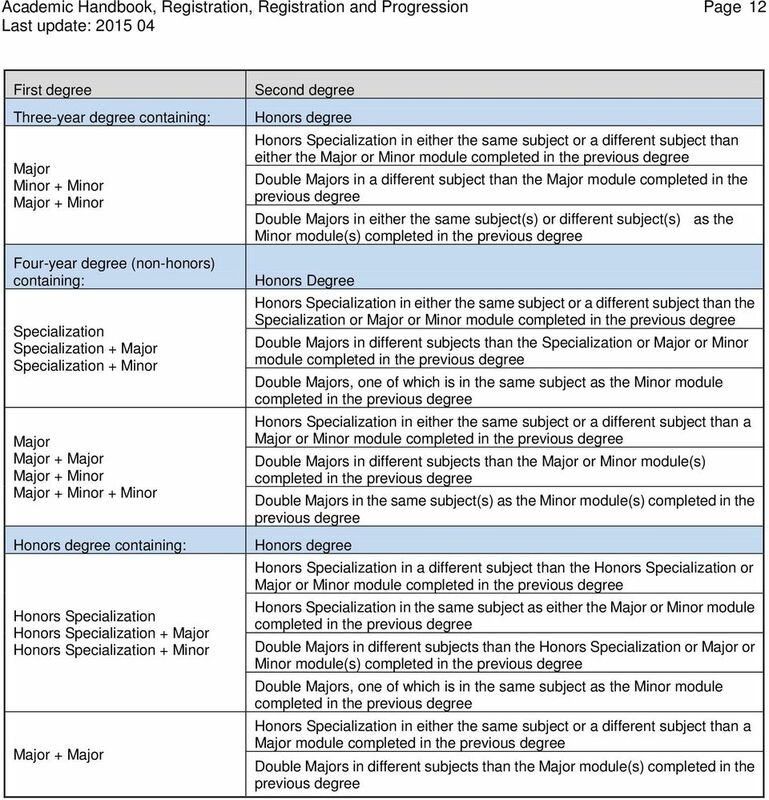 Progression Requirements For progression in a Major module, a student must meet the minimum Progression Requirements to continue at the University. See Progression Requirements section of this calendar. Higher progression standards may be required in some modules. Graduation Requirements Students must meet all graduation requirements for the Bachelor Degree (Four-Year). For complete graduation requirements, refer to the "Graduation Regulations section. The Bachelor Degree (Three-Year) The Bachelor Degree (Three-Year) must include at least one Major module or at least two Minor modules. Registration in the Bachelor Degree (Three-Year) usually begins in the second year, but admission may be gained in the third year. 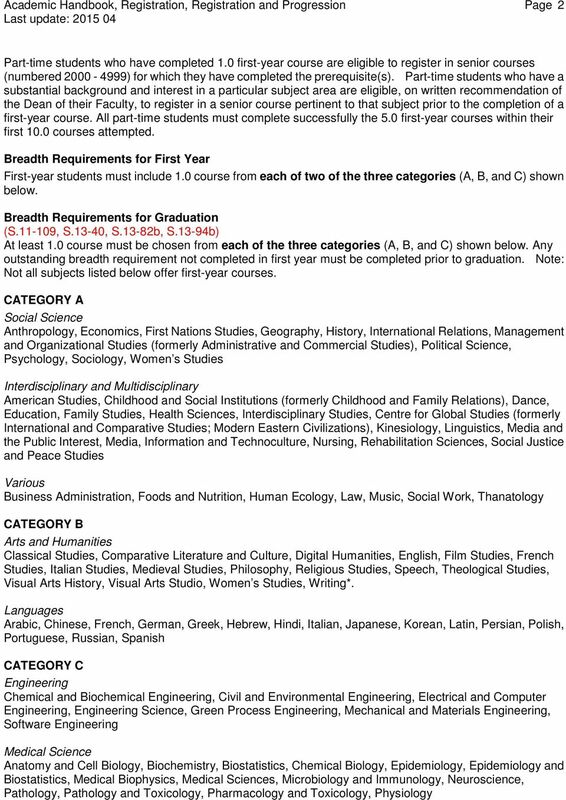 Students intending to proceed to a Bachelor Degree (Three-Year) should consider the degree requirements when selecting courses in first and second years. Bachelor Degree (Three-Year) programs are composed of not fewer than 15.0 successfully completed courses required for the degree. 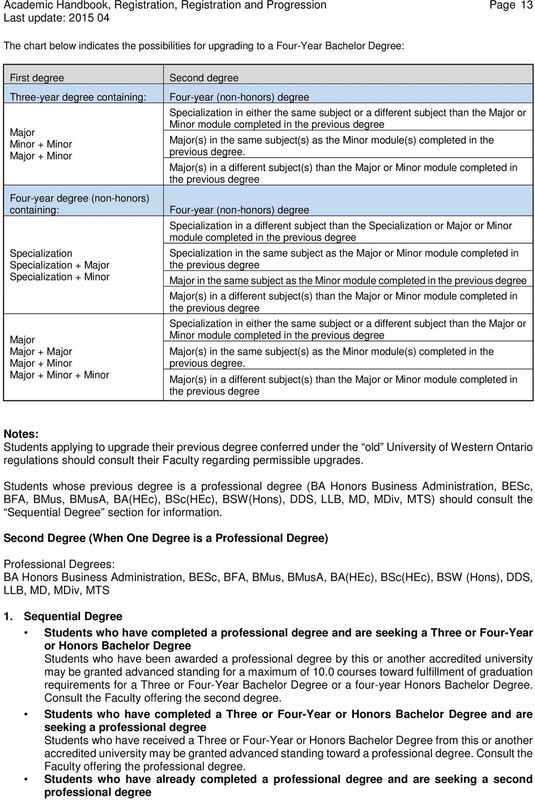 Students admitted with advanced standing to a Bachelor Degree (Three-Year) are required to complete a minimum of 5.0 senior courses (numbered ) offered by The University of Western Ontario or one of the Affiliated University Colleges. Enrolment in some modules may be limited. Major Module Admission Requirements Completion of first-year requirements, including the principal course(s), specified by the department with a minimum mark of 60% in each. Enrolment in some modules may be limited. Progression Requirements For progression in a Major module, a student must meet the minimum Progression Requirements to continue at the University. See Progression Requirements section. Higher progression standards may be required in some modules. Refer to individual department listings. Graduation Requirements Students must meet all graduation requirements for the Bachelor Degree (Three-Year). For complete graduation requirements, refer to the Graduation Regulations section. Double Minor Modules Admission Requirements Completion of first-year requirements, including the principal course(s), of each of two Minor modules with a minimum mark of 60% in each principal course. Enrolment in some modules may be limited. 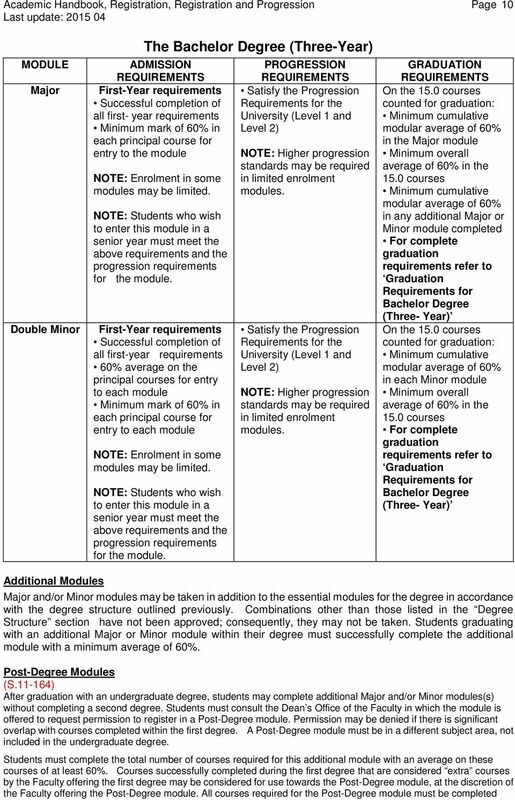 Progression Requirements For progression in double Minor modules, a student must meet the minimum Progression Requirements to continue at the University. See Progression Requirements section of this Calendar. Higher progression standards may be required in some modules. Refer to individual department listings. 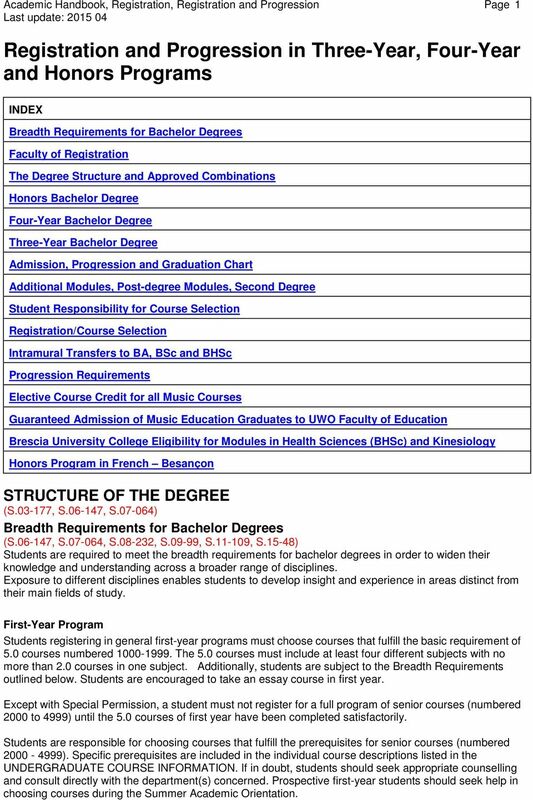 8 Academic Handbook, Registration, Registration and Progression Page 8 Graduation Requirements Students must meet all graduation requirements for the Bachelor Degree (Three-Year). For complete degree requirements refer to the "Graduation Regulations section. MODULE Honors Specialization Double Major (S.10-09) Admission, Progression and Graduation Chart The Honors Bachelor Degree ADMISSION REQUIREMENTS First-Year requirements Successful completion of all first-year requirements 70% average on the principal courses for entry to the module Minimum mark of 60% in each principal course for entry to the module NOTE: Enrolment in some modules may be limited. NOTE: Students who wish to enter this module in a senior year must meet the above requirements and the progression requirements for the module. First-Year requirements Successful completion of all first-year requirements 70% average on the principal courses for entry to each module Minimum mark of 60% in each principal course for entry to each module NOTE: Enrolment in some modules may be limited. NOTE: Students who wish to enter this module in a senior year must meet the above requirements and the progression requirements for the module. PROGRESSION REQUIREMENTS modular average of 70% Minimum mark of 60% in each course of the module Passing grade in each option NOTE: Higher progression standards may be required in limited enrolment modules. average of 70% in each module Minimum mark of 60% in each course of each module Passing grade in each option NOTE: Higher progression standards may be required in limited enrolment modules. NOTE: No exceptions will be permitted. GRADUATION REQUIREMENTS On the 20.0 courses counted for graduation: modular average of 70% in the Honors Specialization module Minimum mark of 60% in each course of this module Passing grade in each option Minimum overall average of 65% on the 20.0 courses modular average of 60% in any additional Major or Minor module completed For complete graduation requirements refer to Graduation Requirements for the Honors Bachelor Degree On the 20.0 courses counted for graduation: At least 1.0 course numbered completed satisfactorily in each Major module modular average of 70% in each Major module Minimum mark of 60% in each course of each module Passing grade in each option Minimum overall average of 65% on the 20.0 courses For complete graduation requirements refer to Graduation Requirements for the Honors Bachelor Degree NOTE: No exceptions will be permitted. 14 Academic Handbook, Registration, Registration and Progression Page 14 Students who have already received a professional degree from this or another accredited university may be granted advanced standing towards the fulfillment of graduation requirements of a second professional degree. Consult the Faculty offering the professional degree. 2. Concurrent Degrees - One Professional and One Bachelor Degree Taken at the Same Time Students who are currently registered in a professional degree may apply for permission to register concurrently in a Bachelor degree. Tuition fees applicable to the professional degree will be assessed and primary registration will reflect the Faculty offering the professional degree. Students must consult the Dean's office of both Faculties for permission to register in, progress in and graduate with a second undergraduate degree with an Honors Specialization, Specialization or Major module. A complete statement by the Dean of the Faculty offering the Three or Four-Year or Honors Bachelor Degree must be forwarded to the student, with a copy to the Office of the Registrar specifying: a) The courses that may be credited towards both degrees to a maximum of 10.0, with no more than 5.0 courses from faculties other than Arts and Humanities, Health Sciences (excluding Nursing), Information and Media Studies, Science and Social Science. b) The number and kind of courses required to complete graduation requirements for the second degree including all senior courses for the Honors Specialization, Specialization or Major. c) These Concurrent Degree regulations do not apply to Senate-approved Combined or Joint degrees. NOTE: In the case of professional degrees for which normal admission requires one or two years of study in a Bachelor degree, the courses taken as part of such a degree must be included among the 10.0 courses Double credited towards both degrees. Students are encouraged to obtain academic counselling from the Dean of each Faculty during the course of their concurrent degree. Students who fail to meet the progression requirements of either degree will be required to withdraw from the concurrent degree. 3. Combined / Joint Degrees Students who wish to complete Combined or Joint Degrees Combined or Joint Degrees are Senate-approved degrees created by two Faculties where one or both degrees are professional degrees. Normally, these academic options are listed within departmental or Faculty degree availability sections. 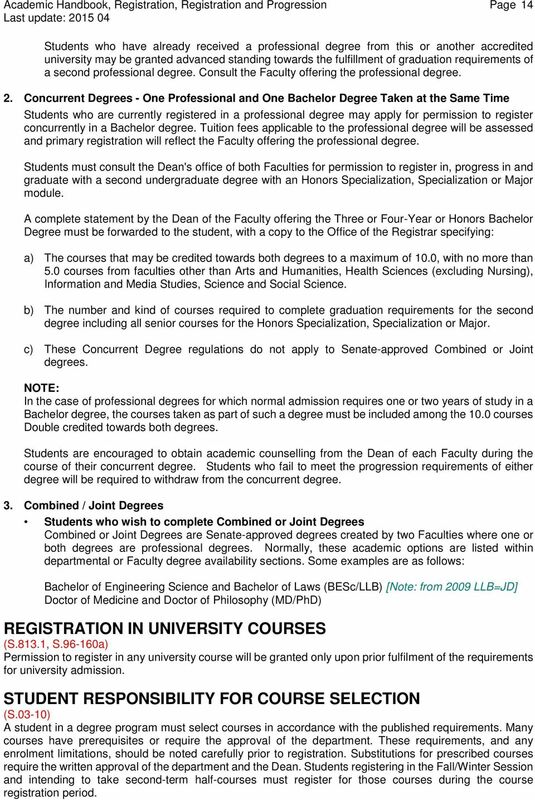 Some examples are as follows: Bachelor of Engineering Science and Bachelor of Laws (BESc/LLB) [Note: from 2009 LLB=JD] Doctor of Medicine and Doctor of Philosophy (MD/PhD) REGISTRATION IN UNIVERSITY COURSES (S.813.1, S a) Permission to register in any university course will be granted only upon prior fulfilment of the requirements for university admission. STUDENT RESPONSIBILITY FOR COURSE SELECTION (S.03-10) A student in a degree program must select courses in accordance with the published requirements. Many courses have prerequisites or require the approval of the department. These requirements, and any enrolment limitations, should be noted carefully prior to registration. Substitutions for prescribed courses require the written approval of the department and the Dean. Students registering in the Fall/Winter Session and intending to take second-term half-courses must register for those courses during the course registration period. 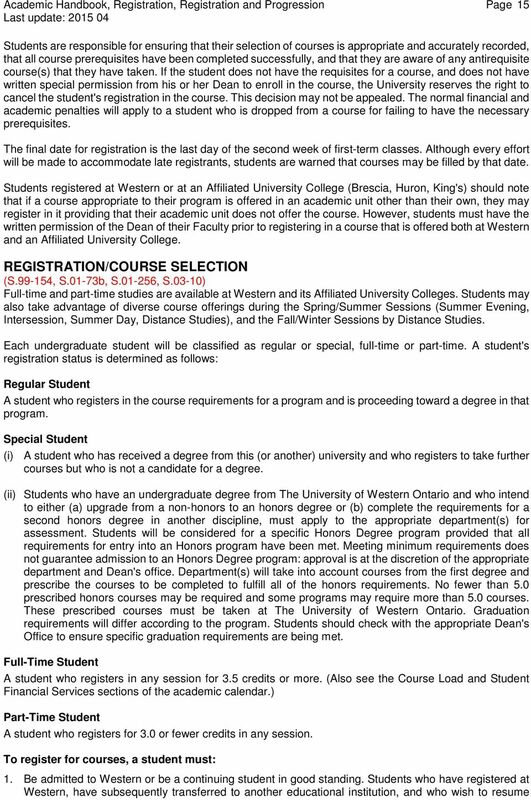 16 Academic Handbook, Registration, Registration and Progression Page 16 studies at Western, are not considered continuing students. Such students are considered transfer students and will be required to submit an application for admission by the applicable deadline. 2. Select courses and ensure such courses are recorded by the Registrar's Office by the appropriate deadline. 3. Pay or make arrangements to pay fees. Failure to register during the designated time will result in a late registration fee. First-Year and Transfer Students will be mailed registration information during the summer. Continuing Undergraduate Students will complete an "Intent to Register" form in February. "Intent to Register" forms will be available on-line to students continuing in the same degree/program. The on-line form and further instructions will be available at Students transferring between Western and its Affiliated University Colleges must indicate their intent on the February "Intent to Register" form. Students in the School of Graduate and Postdoctoral Studies register by mail for each of three terms. Special Students wishing to register in 4000-level courses must obtain departmental permission for each course. INTRAMURAL TRANSFERS TO BA, BSc AND BHSc PROGRAMS (S.1500, S.4178, S ) Students registered at Western in an undergraduate degree program leading to a degree other than the Bachelor of Arts, Bachelor of Science or Bachelor of Health Sciences who wish to transfer into a Three or Four-Year BA, BSc or BHSc program, must submit a request for transfer to the dean of the faculty in which registration is sought. Advanced standing for courses toward a BA, BSc or BHSc degree will be granted in keeping with the program requirements of these degrees at the discretion of the Dean. Approval of the transfer request must include an Intent to Register form completed by the dean of the faculty concerned indicating the courses for which advanced standing is granted, the number and level of courses required to complete graduation requirements and progression requirements. PROGRESSION REQUIREMENTS (S.02-10) Progression Requirements are designed to assist a student in improving his/her grades over time so that she/he may attain the required average for graduation or for entrance to and continuation in honors or other specialized programs. Progression requirements establish the minimum requirements for a student to continue at the University but the expectation is that a student will aspire to excellence and seek to achieve results well above the minimum requirements for his/her programs. The Adjudication Process involves the assessment of a student's eligibility to progress at the University and/or enter or remain in a program. As part of the adjudication process, progression requirements will be checked twice a year during two adjudication periods: the May adjudication period based on marks obtained during the Fall/Winter term (for the September - December and January - April sessions) and the July-August adjudication period based on marks obtained during the Summer term (Intersession, Summer Evening and Summer Day sessions). Student records for those registered for the term are evaluated/adjudicated to ascertain if a student meets the progression requirements: (a) to remain in good standing at the University, (b) of his/her current program, and/or (c) for entrance to another proposed program in which she/he has indicated an Intent to Register. Average Calculation for progression requirements includes both a term (sessional) and a cumulative average for all applicable courses. Average calculations INCLUDE failed grades. All grades below 50% are considered failures. Grades below 40% will be included in average calculations as 40%, grades from 40% to 49% will be included as the actual grade reported. 18 Academic Handbook, Registration, Registration and Progression Page 18 accommodation in a timely manner, may apply for a Dean's Waiver of Progression Requirements. A student granted a Dean's Waiver of Progression Requirements must meet the specific conditions imposed in the Dean's Waiver. For a student who has been required to withdraw, readmission will be at the discretion of the appropriate Admissions Office. See READMISSION FOLLOWING UNSATISFACTORY PERFORMANCE section. Should an appeal be made to Senate on the ruling of a Dean, such an appeal shall be considered on behalf of Senate by the Senate Review Board Academic (SRBA). See STUDENT ACADEMIC APPEALS section. Two levels of progression requirements are used to assess a student's Academic Standing Status: Level 1 progression requirement: A minimum cumulative average of 55% must be obtained at the first adjudication period at which the student has completed a minimum of 3.0 course attempts. If a student has completed more than 3.0 courses at the time of adjudication, marks from all courses taken will be used to calculate the cumulative average. This minimum cumulative average must be maintained for each successive adjudication period until the student reaches Level 2*. Students who satisfy this requirement will be eligible to continue study In Good Standing. Students with a cumulative average from 50-54% will continue On Probation. Students with a cumulative average less than 50% will be Required to Withdraw. Level 2 progression requirement: A minimum cumulative average of 60% must be obtained at the first adjudication period at which the student has completed a minimum of 8.0 course attempts. If a student has completed more than 8.0 courses at the time of adjudication, marks from all courses taken will be used to calculate the cumulative average. This minimum cumulative average must be maintained for each successive adjudication period until the student graduates*. Students who satisfy this requirement will be eligible to continue study In Good Standing. Students with a cumulative average from 55-59% will continue On Probation. Students with a cumulative average less than 55% will be Required to Withdraw. 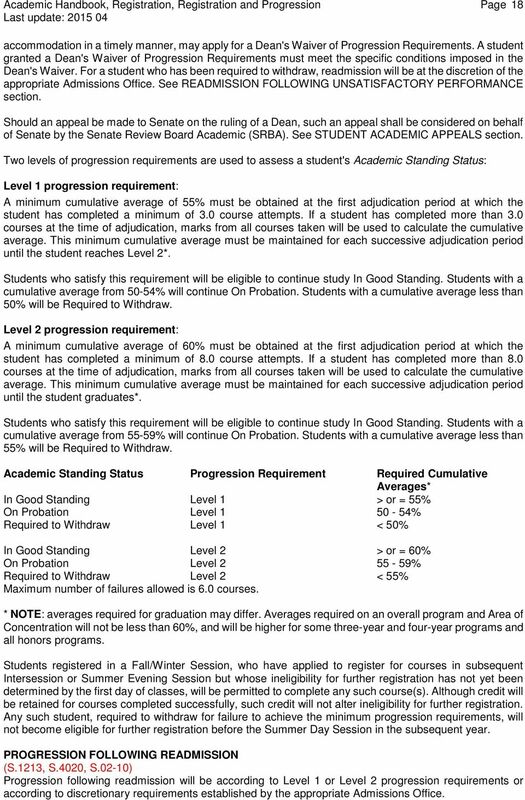 Academic Standing Status In Good Standing On Probation Required to Withdraw Progression Requirement Level 1 Level 1 Level 1 Required Cumulative Averages* > or = 55% 50-54% < 50% In Good Standing On Probation Required to Withdraw Level 2 Level 2 Level 2 Maximum number of failures allowed is 6.0 courses. > or = 60% 55-59% < 55% * NOTE: averages required for graduation may differ. Averages required on an overall program and Area of Concentration will not be less than 60%, and will be higher for some three-year and four-year programs and all honors programs. Students registered in a Fall/Winter Session, who have applied to register for courses in subsequent Intersession or Summer Evening Session but whose ineligibility for further registration has not yet been determined by the first day of classes, will be permitted to complete any such course(s). Although credit will be retained for courses completed successfully, such credit will not alter ineligibility for further registration. Any such student, required to withdraw for failure to achieve the minimum progression requirements, will not become eligible for further registration before the Summer Day Session in the subsequent year. PROGRESSION FOLLOWING READMISSION (S.1213, S.4020, S.02-10) Progression following readmission will be according to Level 1 or Level 2 progression requirements or according to discretionary requirements established by the appropriate Admissions Office. 20 Academic Handbook, Registration, Registration and Progression Page 20 Last Update: level. (Students seeking admission to the Faculty of Education for the Primary/Junior level should follow the standard application process.) Guaranteed admission to the Faculty of Education requires a minimum cumulative weighted average of 75% in Music courses, a 70% average in courses applicable to the second teachable subject for those applying to the I/S program, and no mark below 60% in any course. 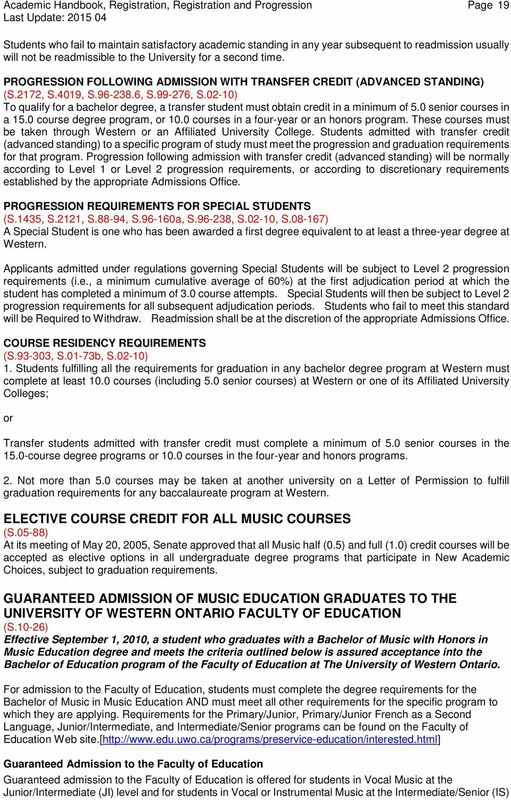 Meeting these graduation requirements guarantees acceptance by the Faculty of Education at The University of Western Ontario, with Music as a teachable subject in either the JI or IS program. Students who fall short of these requirements may still meet the requirements for the Bachelor of Music with Honors in Music Education and may apply to the Faculty of Education on that basis, although admission is not guaranteed. 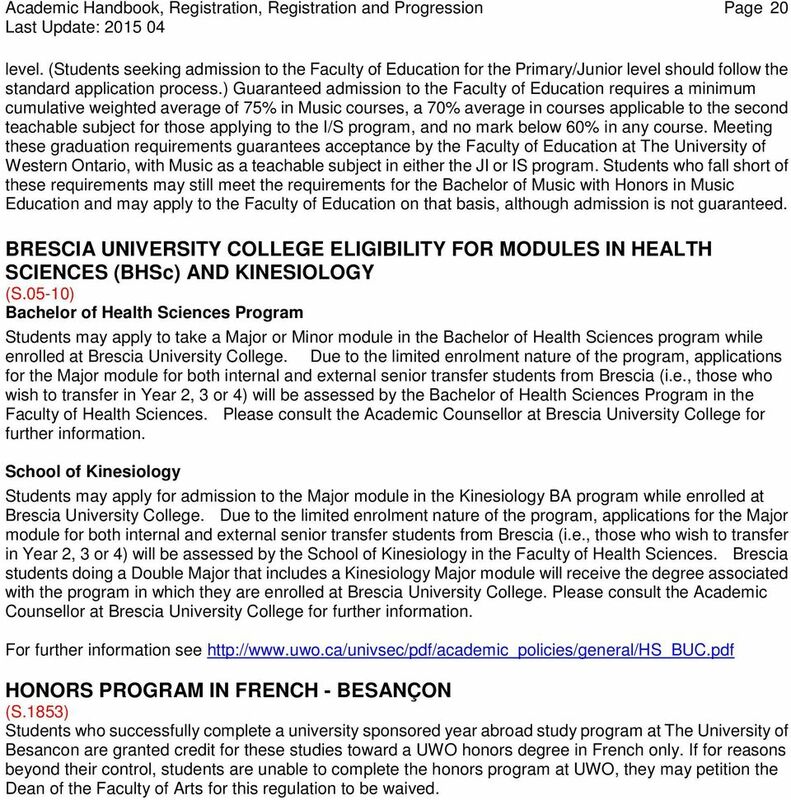 BRESCIA UNIVERSITY COLLEGE ELIGIBILITY FOR MODULES IN HEALTH SCIENCES (BHSc) AND KINESIOLOGY (S.05-10) Bachelor of Health Sciences Program Students may apply to take a Major or Minor module in the Bachelor of Health Sciences program while enrolled at Brescia University College. Due to the limited enrolment nature of the program, applications for the Major module for both internal and external senior transfer students from Brescia (i.e., those who wish to transfer in Year 2, 3 or 4) will be assessed by the Bachelor of Health Sciences Program in the Faculty of Health Sciences. Please consult the Academic Counsellor at Brescia University College for further information. School of Kinesiology Students may apply for admission to the Major module in the Kinesiology BA program while enrolled at Brescia University College. Due to the limited enrolment nature of the program, applications for the Major module for both internal and external senior transfer students from Brescia (i.e., those who wish to transfer in Year 2, 3 or 4) will be assessed by the School of Kinesiology in the Faculty of Health Sciences. Brescia students doing a Double Major that includes a Kinesiology Major module will receive the degree associated with the program in which they are enrolled at Brescia University College. Please consult the Academic Counsellor at Brescia University College for further information. For further information see HONORS PROGRAM IN FRENCH - BESANÇON (S.1853) Students who successfully complete a university sponsored year abroad study program at The University of Besancon are granted credit for these studies toward a UWO honors degree in French only. 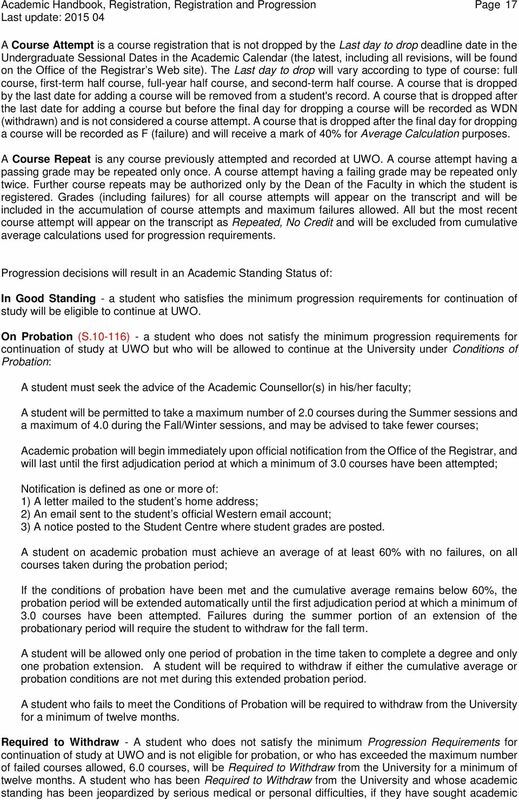 If for reasons beyond their control, students are unable to complete the honors program at UWO, they may petition the Dean of the Faculty of Arts for this regulation to be waived. 2013-2014 UW-Madison All Degrees Awarded (Source: https://registrar.wisc.edu/documents/stats_degcntsbydeglvlandgenderwndegmjrandfy. Admissions. Graduate Studies. Areas in Which Graduate Study Is Offered. Master s Degrees. Faculty of Agricultural and Food Sciences. BYLAWS OF THE GRADUATE COLLEGE UNIVERSITY OF ILLINOIS AT CHICAGO. Article I: Name and Object. Students must have completed or be currently enrolled in courses that fulfill all program requirements at the time of petition. Bachelor of Science. All students entering the Bachelor of Science degree program at the Thompson Rivers University enroll in a TRU degree program. 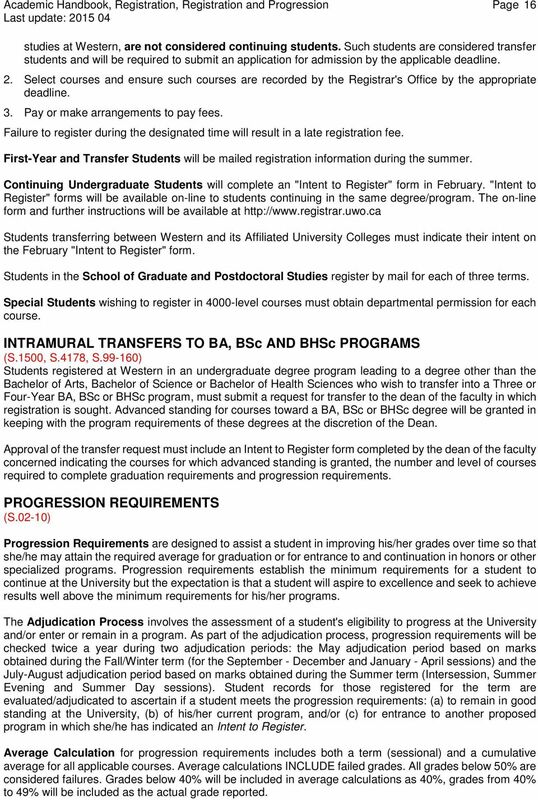 The Honors Program is under review, and these terms may be modified for the 2012-13 Academic Year.